A handful of years ago I pedaled toward a sign stapled on a fence. I slowed, then stopped and chuckled. According to local news reports, several people claimed they’d spotted a cougar around this area. Warnings were posted, like the sign on the fence. There was a smidgen of nervousness in my laughter because yours truly was the only obvious biking or walking warm body in that section of Fresno’s Woodward Park. The asphalt path continued east, paralleling open fields, copses of trees—excellent cover for large, sneaky felines—and the San Joaquin River. I felt . . . alone, isolated. I also chuckled because I’d been wondering about John the Baptist. I doubted many people on this chilly late November morning were contemplating the Baptist’s ancient words. But I was. And so, staring at the warning signs, I recalled his: every tree therefore that does not bear good fruit is cut down and thrown into the fire. The Baptist challenged the crowds on the banks of the Jordan River. Hmmm . . . a warning along a river? Out here, on Fresno’s far north side and its half-million residents, I’ve witnessed deer, rabbit, bobcat, and coyote. Woodward Park hugs the San Joaquin River. At 330 zig-zagging miles, it’s the state’s second-longest river. I’ve hiked lake basins in the Sierra Nevada Mountains, high on the rugged crest, which marked the San Joaquin’s alpine birth. Between the granite peaks and where I read the warning sign are national parks, dams, farms, highways, subdivisions, strip malls, and fast food joints. Still, the river is a corridor, a route from wilderness to civilization. I’m never surprised when spying a coyote stalking a rabbit in these lowlands. 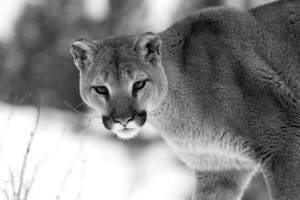 However a cougar, an elusive predator, was a different story. Hey, I’m on a bike . . . couldn’t I outrace ‘em? Later I learned they sprinted 30-35 miles per hour. Pedaling might be my last activity! Hey, I wouldn’t bump into one because Fresno’s huge, with over a hundred square miles of sprawl. However—yikes—a cougar’s territory can cover thirty square miles. That narrowed the safe acreage. Hey, I’m big fella, and also reasonably bright! Alas, an average cougar, tail to head, was bigger than me. And, let’s not sugarcoat this, those jaws and claws wouldn’t be impressed with my book learning. Let’s return to the safer Jordan River. Advent is cranky with its Biblical warnings. We’d prefer to scurry to the kid in the manger, but first we travel through wilderness. John keeps appearing and though what he preaches doesn’t always foreshadow Jesus—Matthew’s beatitudes don’t jive with a winnowing fork or chopped trees—I hesitate to ignore the guy on the honey and locust diet. Maybe I even chuckle at John . . . nervously. I know seasonal warnings. As a little tyke—knee high to a grasshopper my grandmother would’ve said—I awoke one early Christmas and decided to sneak a peak at the presents. My older sister joined me. Was it her idea or mine? Who cares? With my parents slumbering, and the tree loaded with presents, we snuck into the living room and surveyed the bounty. Why not open a present? After all, it was Christmas morn . . . and nary a creature was stirring! I selected a gift from an aunt and uncle, a spring-loaded pistol that fired rubber darts. Might as well test it. I had no idea what my sister unwrapped. Probably something boring and quiet, like a doll or clothing. I propped the target against a chair. 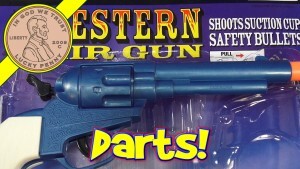 Like Paladin on TV’s “Have Gun, Will Travel,” I aimed at the bull’s-eye in the middle of the thin, slick metal surface. I pulled the trigger. Hooray for Christmas! But then I sensed the presence of a third person in the shadowy yuletide dawn. My mother. Eyes afire. Her house robe billowed like the wings of an avenging angel. I froze. My sister froze. Then Mom spoke, emitting a guttural, primal sound that probably caused the tree to shed needles. I’ve looked back at that Christmas encounter, picturing my parents waking from well-deserved sleep. Did they debate who’d leave the toasty bed to confront their naughty kids? Did Mom win or lose?Of course we want to race toward the manger and get to the swell stuff and glad tidings and good news. And yet those warnings matter. Years later my mother, no longer in the avenging Christmas angel mode, gave my wife and I a ceramic manger scene that she’d painted. Every year my Advent preparation includes positioning the colorful shepherds, stately camels and, of course, the cherubic Jesus. 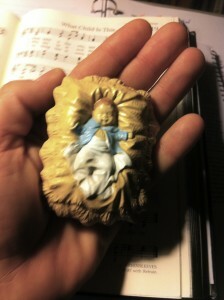 As I place the crèche on the mantel, gentle with each unique creation, there’s no John the Baptist figurine. Of course not: gnarly, snarly old John doesn’t belong among the traditional manger characters! But maybe, I imagine, the Baptist lurks out of sight. 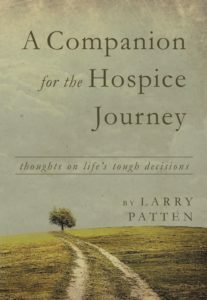 He warns us to be careful in our Advent sojourn. And what about that big cat along the wending course of the river? Was a cougar spotted or did someone mistakenly observe a tawny-coated dog slinking through the underbrush? I traversed the lonely park trail, alert as I pedaled, moving between wilderness and civilization, between dark and light, between childish foolishness and adult faithfulness. Thanks, Nancy! Interesting question . . . does anyone have a John the Baptizer in a creche? And would it be the infant John, or the older, grumpier John? !